RESEARCH TRIANGLE PARK, NC--(Marketwired - February 10, 2015) - Regulatory affairs groups face significant challenges when trying to communicate specific regulatory requirements to other groups within their organizations. According to pharmaceutical intelligence provider Cutting Edge Information, ensuring that clinical trials reflect regulatory priorities can be a significant hurdle for some groups. 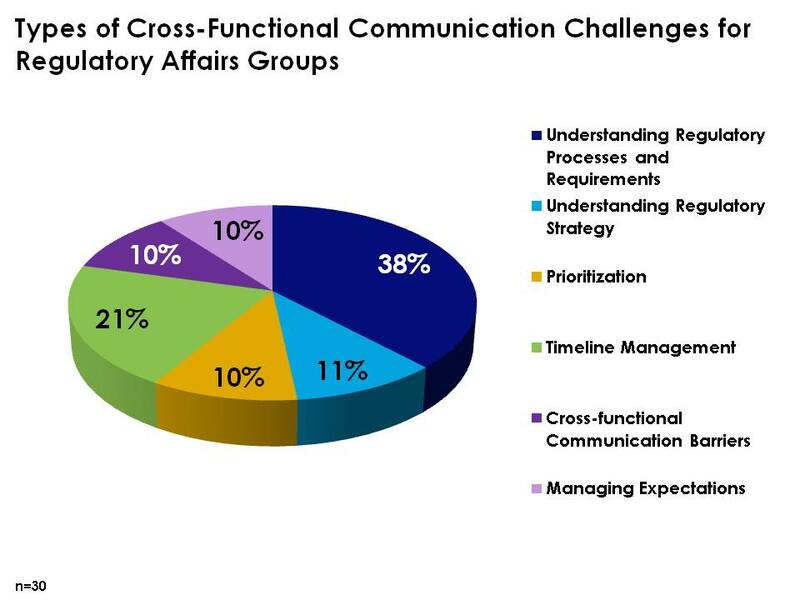 Recent study findings suggest that 38% of the challenges listed by regulatory groups are related to effectively communicating regulatory processes and requirements. Another 21% of the challenges relate to timeline management. In examples cited by interviewed regulatory affairs directors, some internal teams may not be aware of how frequently the regulatory environment changes. In other cases, a team may think an agency will approve a drug purely on the clinical benefits and, as a result, may underplay priorities around cost effectiveness and trial design. "Some non-regulatory functions may not realize the potential impact of regulatory strategy on product development, market authorization and post-approval marketing," says Jacob Presson, Senior Analyst at Cutting Edge Information. "These misconceptions can frustrate all involved and, if managed poorly, become serious impediments to productive cross-functional coordination." According to "Pharmaceutical Regulatory Affairs: Arming Regulatory Groups with Voice and Influence to Meet Strategic Challenges," a research report by Cutting Edge Information, pharmaceutical regulatory affairs groups can correct these misunderstandings through discussions about regulatory guidances, processes and strategy. Regulatory groups offer clarity on current agency guidelines and highlight how they will impact the product's development. Beyond emphasizing requirements, regulatory affairs should also communicate the benefits of regulatory strategy to cross-functional teams. Strategic recommendations to better educate internal teams on regulatory groups' importance. Insights and best practices for improving cross-functional communication throughout the product lifecycle. Steps for gaining a deeper understanding of agency requirements and concerns. Detailed data showing communications between regulatory groups and internal and external teams, as well as budgets and activities supported by RA groups. For more information on "Pharmaceutical Regulatory Affairs: Arming Regulatory Groups with Voice and Influence to Meet Strategic Challenges" and other regulatory affairs reports by Cutting Edge Information, please visit http://www.cuttingedgeinfo.com/library/regulatory/. Recent study findings by Cutting Edge Information suggest that 38% of the communication challenges listed by pharmaceutical regulatory affairs groups are related to effectively communicating regulatory processes and requirements. 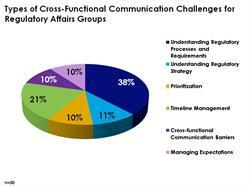 Another 21% of the challenges relate to timeline management and 11% to understanding regulatory strategy.